Orbignya barbosiana Burret, Orbignya huebneri Burret, Orbignya martiana Barb. Rodr., Orbignya oleifera Burret, Orbignya phalerata Mart., Orbignya speciosa (Mart. ex Spreng.) Barb. Rodr. Babassu (Attalea speciosa Mart. ex Spreng.) is an erect perennial evergreen palm, reaching up a height of 15 to 30 m. The trunk is slender, ringed with leaf scars, 20-50 cm in diameter. A dense rounded crown, 8 m in diameter, is formed by 15-20 huge leaves up to 9 m long. Attalea speciosa bears 2-4 inflorescences of whitish or yellowish flowers. Bunches are 1 m long, weigh 40-90 kg and bear 250 to 600 fruits twice a year. The fruits are oblong nuts (8-15 cm long x 5-9 cm broad) containing 3-8 kernels surrounded by fleshy pulp and a hard woody shell, similar to the coconut shell. 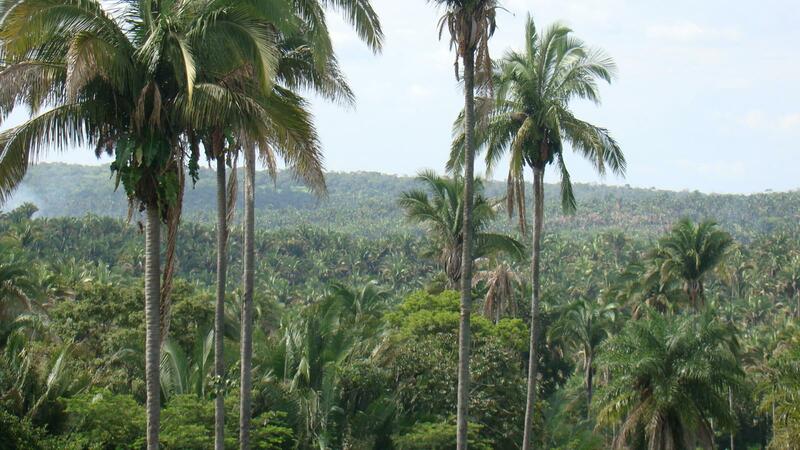 Babassu starts yielding after 8 years and reaches full production within 15-20 years. Nut yields range from 20 kg/ha in wild stands to 1500 kg/ha in experimental stations. One ton of nuts yields 10% kernels containing 60-70% oil (Ecoport, 2010; Ecocrop, 2010; El-Bassam, 1998; Göhl, 1982). In Brazil, mature fruits start to drop between August and November and continue to fall until the rainy season begins in January and February (Axtell et al., 1992). Babassu is primarily grown for its oil, which is similar to coconut oil and used to make margarine, soaps, detergents and lamp oil. Babassu oil does not readily become rancid. Oil extraction results in a cake containing 15-25% protein (depending on the shell content), which is a valuable feedstuff. The flesh of ripe fruit flesh is used to prepare starch and ethanol. Shells are used for fuel or to make charcoal. Babassu leaves are used for thatching and basketry or as fodder (Ecocrop, 2010; El-Bassam, 1998). Babassu is native to Brazil, Guyana, Suriname and Bolivia (USDA, 2010). It is now widespread in Mexico. It is generally found in tropical humid climates, along rivers and valley floors (Ecoport, 2010; El-Bassam, 1998). Optimal growth conditions are 1200-1700 mm annual rainfall and 25°C-30°C average day-temperatures, with plenty of sunshine on well drained fertile soils. Babassu is not tolerant of waterlogging and flooding but it can withstand short periods of heavy rainfall (Ecoport, 2010; El-Bassam, 1998). In pastures, babassu provides shade for cattle and increases moisture retention and organic matter content in soils (May et al., 1985). At low densities (less than 100 trees/ha) and under regular pruning and burning of babassu leaves (every 4 years), it improves soil nutrient status, increases soil pH and clears space for associated crops. 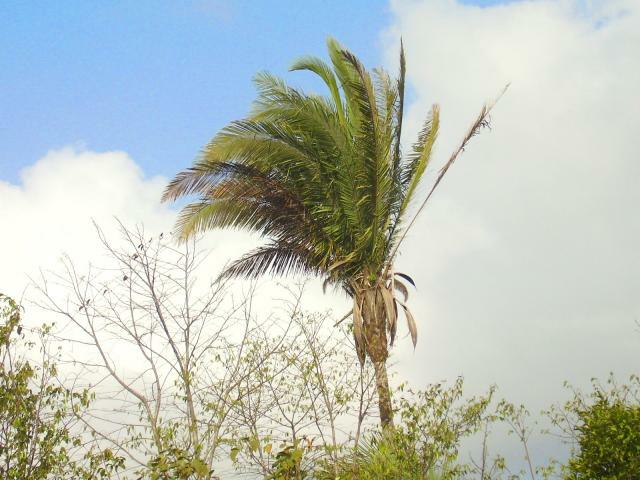 Babassu is also an indicator of fertile soils (Kass et al., 1999). 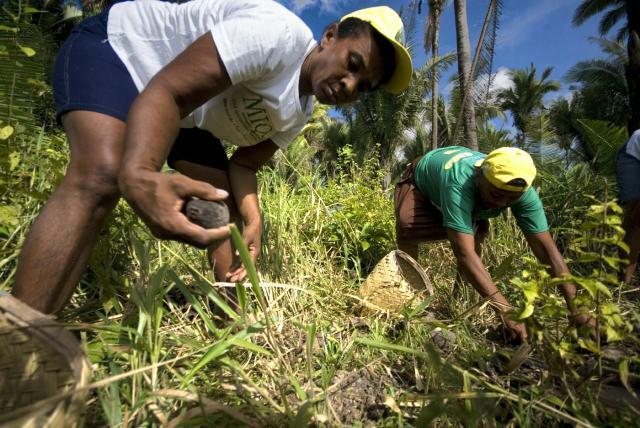 Sun exposure promotes seedling growth and babassu can become a weed in certain conditions. It is an aggressive competitor that is difficult to control as its apical meristem remains below ground for several years after the leaves have emerged. Mechanical control (fruit removal, uprooting) is often necessary. Grasses such as Brachiaria brizantha can have a suppressive effect on the development of young babassu plants (Mitja et al., 2001). Babassu oil meal can be classified either as a protein feed or as an energy feed. It contains about 22-25% DM of crude protein and high but variable amounts of fibre (15 to 32% DM of crude fibre) and fat (1 to 7% DM, depending on the extraction process). Its composition is similar to that of copra meal but it is more fibrous and its lignin content (4-14% DM) is often much higher (Feedipedia, 2013; Rocha Junior et al., 2003). The flesh of the fruit consists mostly of carbohydrates (80% DM). It is fibrous (14% DM) and very poor in protein (2% DM) and fat (0.2% DM) (Smits et al., 1988). The kernels must be well dried before oil extraction in order to prevent rancidity (El-Bassam, 1998). Drying prevents the growth of aflatoxin-producing Aspergillus fungi. The aflatoxin content of babassu products is regulated, in some circumstances by law. An example of this is the European Directive 2002/32/EC on undesirable substances that limits aflaxtonin B1 content in babassu products to 0.02 ppm (European Community, 2002; EFSA, 2004). The fruit was found to have a goitrogenic effect on rats (Gaitan et al., 1994). Babassu meal can be used in ruminant diets. Due to its low cost, it can be an economically viable substitute for more expensive sources of protein and energy. It is palatable and used in the same way as coconut meal (Göhl, 1982). Babassu meal is included in tropical grass silages to improve their nutritive value, but inclusion of more than 5-10% DM seems to degrade the fermentation characteristics of silage (Vieira et al., 2007). Babassu meal has a lower DM and ruminal crude protein degradability (about 50%) than many other by-products, due to a low soluble fraction (Marcondes et al., 2009). Total apparent DM, OM or NDF in vivo digestibilities in sheep are low (also about 50%) compared to other by-products (Rocha Junior et al., 2003). In dairy cattle (350 kg, 8 kg milk/d), replacing of wheat middlings by babassu meal (1:1 on DM basis, 9% of total dietary DM) did not affect milk production and DM intake (Silva, 2006). In dairy heifers, 15% (diet DM) of babassu meal did not change the feeding and ruminating behaviour of the animals (de Castro et al., 2009). There are no records of using babassu oil meal in pig diets (2012). Its use should be similar to that of copra meal, but more limited due to its higher fibre and lignin content. Babassu mesocarp was tested successfully in pigs in a diet containing potato as the protein source. The estimated net energy value was 8.5 MJ/kg (Smits et al., 1988). The value of babassu meal in poultry feeding is limited by its high fibre level, which is higher than that of copra meal. In growing and finishing broilers, the inclusion of up to 12% babassu meal in isoenergetic diets tended to increase the feed conversion ratio but did not significantly decrease animal performance (Carneiro et al., 2009). In slow-growing broilers ("Label Rouge"), the inclusion of more than 8% babassu cake in the diet worsened the feed conversion ratio in the younger animals (1-28 day-old). Older chicks (36-84 day-old) showed good performance (body weight and weight gain) and no changes in carcass quality (fat and protein deposition) at up to 24% babassu cake in the diet, whereas the feed conversion ratio increased with 32% babassu cake (Fausto da Silva, 2009). Silva, T. C. da P., 2006. Substituição do farelo de trigo pela torta de babaçu na alimentação de vacas mestiças em lactação. Dissertation, Universidade Federal Rural de Pernambuco, 41 p.
Smits, B. ; Sebek, L. B. J., 1988. Use of wet byproducts and waste materials in diets for pigs. Mededelingen - Instituut voor Veevoedingsonderzoek, 11, 69 pp.